The Red Wedding was well and truly shocking TV—even for Game Of Thrones, even for an episode whose source material was 13 years old at the time of air. But it also posed the threat of transforming the series into something that was primarily known for its shocks, that uneasy footing created by Ned Stark’s execution twisted into something crueler, a blockbuster pop-culture phenomenon in which viewers cheered George R.R. Martin, David Benioff, and D.B. Weiss on as they hunted their characters for sport. Just from a storytelling perspective, there was only going to be so many times they could pull off this kind of surprise. At a certain point, your audience is going to arrive at every season’s ninth episode anticipating the deaths of one or more characters that would’ve been untouchable on any other show. And then the second episode of the fourth season came for the king and did not miss. And by god(s) did he have it coming: Martin’s script for “The Lion And The Rose” takes a deliciously claustrophobic turn around its midpoint, locking us into the wedding day of Joffrey Baratheon and Margaery Tyrell. 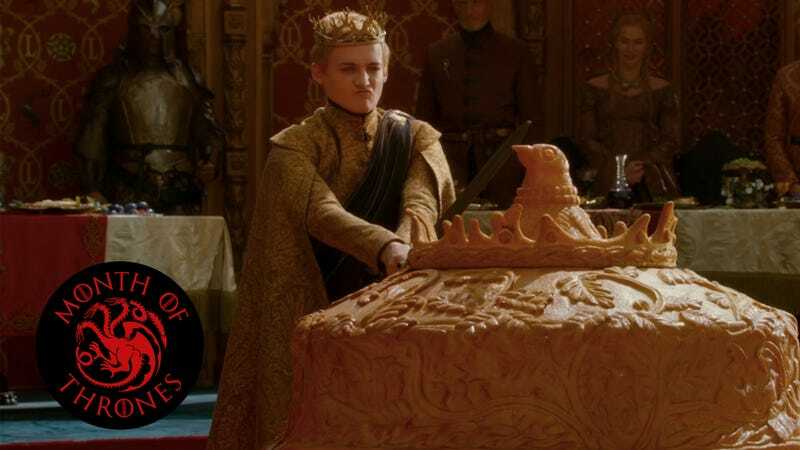 It’s some of Game Of Thrones juiciest castle intrigue set against a backdrop that feels less like a celebration of a royal union and more like a birthday party for the most spectacularly spoiled boy in the world. Jack Gleeson tears into his final Game Of Thrones scenes like Valyrian steel through a pie, begging for a million slaps as Joffrey turns a day that’s supposed to be about him and his bride into a systematic humiliation of his uncle, his former fiancé, his new brother-in-law, and so many others who hadn’t the fortune/misfortune to be born Joffrey Baratheon. He hacks the wedding gift of a historical volume to bits with the sword he smugly dubs Widow’s Wail; he smirks and sneers as little people reenact battlefield embarrassments directly targeted at Sansa and Loras, the disparagement of Tyrion the subtext of the entire charade. The tension of the occasion is sustained magnificently by director Alex Graves (and at least momentarily broken by the funniest Natalie Dormer would ever be on the show: “Oh look: The pie!”), the focus seamlessly shifting between friction between the guests and the sour atmosphere fostered by the man of the hour. The wedding feast is an all-time great Game Of Thrones set piece, where characters who don’t always have occasion to interact get to snipe at one another, and the absurd opulence of the Seven Kingdom’s ruling class is put on colorful, abominable display. The Red Wedding featured guests ferrying the happy couple to their wedding bed and a monumental massacre, yet Graves manages to make the proceedings at The Purple Wedding seem plenty barbaric on their own—even before any poison passes Joffrey’s lips. The eventual whodunit is stealthily established in furtive glances (we see you, Queen Of Thorns) and camera lingering, but The Purple Wedding is equally commendable for its emotional complexity. Here’s a death Game Of Thrones viewers have been begging for from the start, yet there’s still some sympathy to be mined in the grief expressed by Lena Headey, or the way Jaime barrels his way through onlookers to reach the side of the boy he pretends is his nephew (but even the most pickled wedding guest knows is his son). Whatever glee there is to be derived from the death of one of TV’s most detested villains, a sense of peril soon sets in, as the disgraced Ser Dontos aids Sansa’s escape and Cersei looks up from her son’s corpse to cast an accusatory glance at the younger brother now holding the goblet that killed the king. It all fits together so well, the element of surprise feels almost secondary. And yet, just 10 months after Game Of Thrones had staged its biggest shocker to date, it topped it. The memory of The Red Wedding will never fade, but The Purple Wedding is the example other TV dramas should aspire to. The show didn’t wait at all to find a new character everyone could hate: This is the episode that opens with Ramsay, still a Snow, hunting a woman for the perceived offense of making Myranda jealous; he then introduces his father to “Reek,” the persona he’s forced upon a broken and brainwashed Theon. Melisandre’s doing her own measure of button-pushing in Dragonstone, where the fires of Lord of Light fanaticism burn bright and deadly, even as Stannis loses the faith. Up north, Bran gives the Game Of Thrones faithful several new images to dissect, including the shadow of a dragon falling over King’s Landing and a snowy sept like the one Dany saw in the House of the Undying. See more content like this on "Season Four"